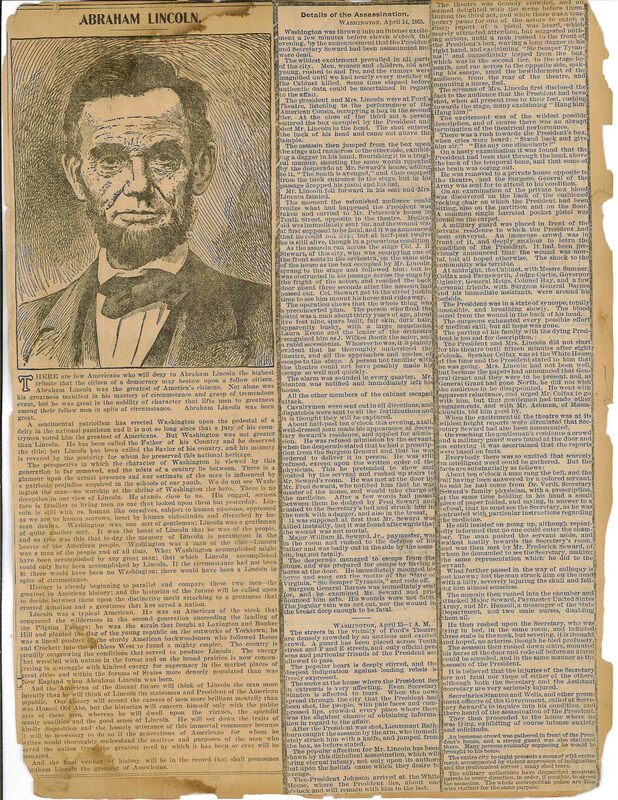 A newspaper article detailing the night of the assassination. The article gives general information on Lincoln’s life and predictions for how historians will view him in the future. It continues on to talk about the rumors the night of the shooting, and how the public reacted to the initial news including rumors spreading quickly through the city and beyond. Use of this item for research, teaching and private study is permitted with proper citation and attribution to the Museum of the Grand Prairie, Champaign County Forest Preserve District. Reproduction of this item for publication, broadcast, or commercial use requires written permission. For permission please contact Museum of the Grand Prairie, Champaign County Forest Preserve District: http://www.museumofthegrandprairie.org/about.html.